Heat the olive oil in a saute pan over medium low heat. 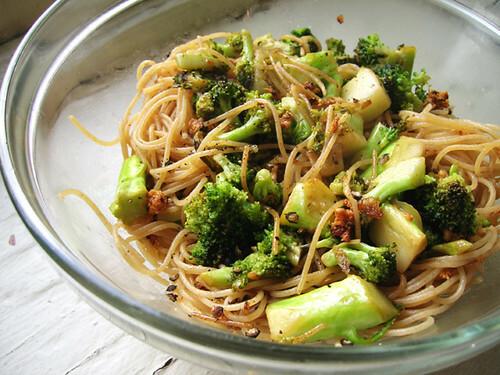 Cut the broccoli into tiny florets, and chop any stem pieces about the size of the florets. Peel and mince the garlic, and saute over medium high heat until golden. I'd guess that this takes about ten minutes; but keep your eye on the garlic the whole time, because it goes fast as soon as it changes color and you don't want it burned. Scoop the garlic out of the pan and set it aside. Okay now, CAREFULLLY, add the lemon juice to the hot oil, which will spatter like mad. If it's too much danger, this recipe also tastes good without the lemon juice. I know you laugh at danger, though. Whisk the lemon juice with the oil, so you're making a sort of hot lemon vinaigrette. Add the broccoli to the pan and saute until crisp tender. Meanwhile cook the angel hair until al dente, about four minutes. Drain the pasta and when the broccoli is cooked, stir in about half the pasta and put away the rest of the pasta for later. If you have cooked pasta that you put away before, you can just add it right to the pan after the spinach is cooked and heat through. Add the sauteed garlic, and mix well.